Description: This medium-sized tree is 40-70' tall at maturity, forming a trunk up to 3½' across and a crown that is more or less ovoid. The relatively stout trunk can be straight or somewhat crooked, while the larger branches are ascending to widely spreading and rather crooked. 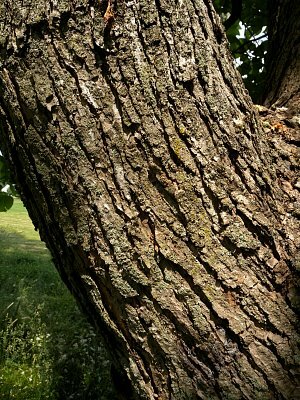 On mature trees, trunk bark is gray-brown, rough-textured, and longitudinally furrowed between narrow scaly plates. The bark of larger branches is more gray and less rough-textured, while young twigs are brown to reddish brown, smooth, and hairless. 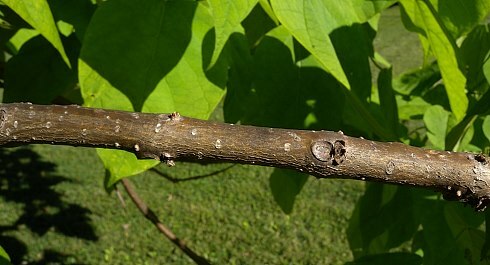 Young twigs have scattered white lenticels (air pores) and depressed leaf scars. Leaves occur oppositely or in whorls of 3; they tend to hang downward from the twigs. The leaf blades are 6-12" long and 4-8" across; they are cordate to cordate-ovate in shape and smooth along their margins. Sometimes a leaf blade may have a pair of shallow obtuse lobes. The upper surface of the leaf blades is yellowish green, light green, or medium green and hairless (or nearly so), while the lower surface is more pale and short-pubescent. The petioles are 4-6" long, light green, and either hairless or mostly hairless. This tree produces erect pyramidal panicles of flowers about 4-12" tall and nearly as much across; there is typically 10-30 flowers per panicle. Individual flowers are 1½-2" across and 2-2½" long; each flower has a broad tubular corolla with 4-5 frilly lobes, a calyx that is deeply divided into 2 lobes, a 2-celled pistil with a white style, 2 long fertile stamens, and 3 short infertile stamens (staminodia). The corolla is bright white overall; it has purple-dotted lines and patches of bright yellow along the lower surface of its throat. The lobes of the calyx are oval-ovate, light green to purple, and either hairless or finely pubescent. The branching stalks of the panicle are green and hairless. The blooming period occurs from late spring to early summer, lasting about 2 weeks. Individual flowers remain in bloom for only a short time; they have a pleasant fragrance. Afterwards, fertile flowers are replaced by narrowly cylindrical seedpods that are 10-18" in length and about ½" across; they are either straight or slightly curved, and droop downward from short stalks. Immature seedpods are green, while mature seedpods are dark brown. During the fall and winter, the seedpods slowly divide into 2 parts, releasing their seeds. The seeds are arranged in conjoined pairs with outer fibrous wings; they are covered by a papery membrane that is light brown. Each pair of winged seeds is about 1-2" long and ¼" (or a little more) across. Individual seed bodies are about 5 mm. long and 4 mm. across, oval in shape, and flattened; their tips are well-rounded, rather than pointed. The pairs of winged seeds are very light and easily blown about by the wind. The root system is relatively shallow and spreading. The large deciduous leaves become pale yellow or pale greenish yellow during the autumn. Cultivation: The preference is full or partial sun, moist well-drained conditions, and fertile soil that contains loam or silt-loam. However, this tree will adapt to other situations that are less ideal. 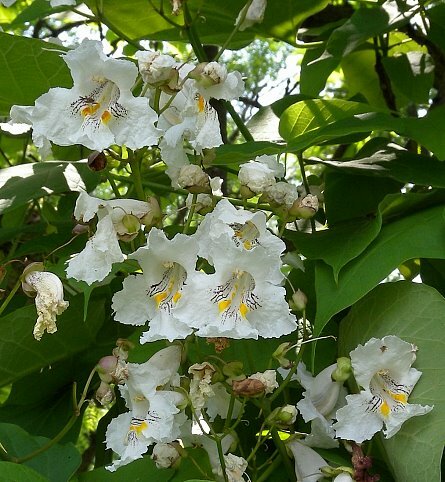 Northern Catalpa develops quickly, particularly while it is young, but its longevity is short (typically about 60 years). The twigs and branches are somewhat brittle and can be damaged by wind and ice storms. Because of the large leaves, abundant large flowers, broken twigs and branches, long seedpods, and winged seeds, this tree produces abundant ground litter. Range & Habitat: Northern Catalpa is an uncommon tree in natural areas; it is native to southern and southeastern Illinois, while in other areas of the state it has escaped from cultivation (see Distribution Map). Originally, this tree was native to a small region of the mid-Mississippi valley. Habitats include mesic woodlands, moist floodplain and bottomland woodlands, moist woodland openings, higher ground in swamps, powerline clearances in moist wooded areas, railroad clearances in moist wooded areas, woodland borders, edges of yards in suburban areas, and urban parks. Areas with a history of disturbance are preferred. This tree continues to spread in areas outside of its original range. It is often cultivated as an ornamental landscape tree. Faunal Associations: The flowers of Northern Catalpa are cross-pollinated by bumblebees (Bombus spp. ), the Large Carpenter bee (Xylocopa virginica), and various moths that are primarily nocturnal visitors. Other floral visitors include honeybees (Apis mellifera), skippers, ants, and flies, but they are less effective at cross-pollination. These insects usually obtain nectar from the flowers. This tree also has extra-floral nectaries on its leaves, which secrete nectar in greater amounts than normal when the leaves are damaged. This attracts such predacious insects as ants, ladybird beetles, and parasitoid wasps, which feed on nectar that is easy to access. It is thought that such insects help to protect this tree from various insect pests that feed on the leaves. These pests include the caterpillars of Ceratomia catalpae (Catalpa Sphinx) and Xylophanes tersa (Tersa Sphinx), the larvae of Contarinia catalpae (Catalpa Midge), the aphids Aphis citricola and Myzus persicae, and Pseudococcus comstocki (Comstock Mealybug); both the aphids and mealybug are highly polyphagous. Birds and mammals apparently make little use of the leaves or seeds of this tree as a food source. However, when little else is available, rabbits and small rodents will gnaw on the bark of saplings. Sometimes the broken-off branches and trunks of older trees develop cavities that are used as dens by tree squirrels and other small mammals, or they are occupied by Screech Owls and other cavity-nesting birds. American Robins and other birds sometimes build nests in the branches. Photographic Location: Chief Schemauger Park and Crystal Lake Park in Urbana, Illinois. 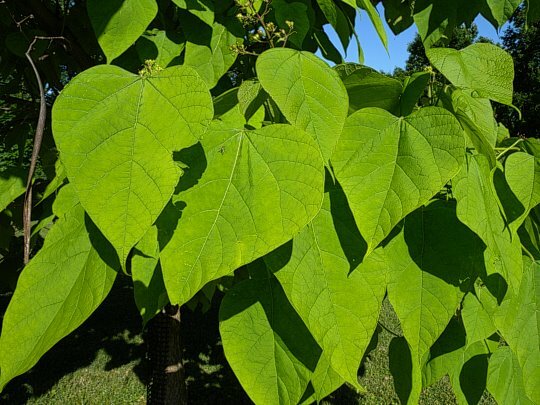 Comments: Northern Catalpa is one of two species in this genus that occur in Illinois -- the other species, Catalpa bignonioides (Southern Catalpa), is native to a fairly small region of southeastern United States, but not Illinois. This latter species is also cultivated throughout the state as a landscape tree and it occasionally escapes. Distinguishing these two species is rather difficult as they both have similar leaves, flowers, and seedpods. 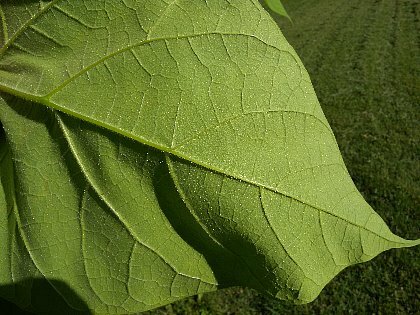 The following characteristics can be used to distinguish Northern Catalpa from its more southern sibling: 1) its crushed leaves do not have an unpleasant scent, 2) its flowers are slightly larger in size with fewer purple spots, 3) it tends to have fewer flowers per panicle, 4) it has slightly longer and wider seedpods, 5) for mature trees, its trunk bark is more furrowed, and 6) both tips of its seeds are blunt, rather than pointed on one side. Unfortunately, there is some overlap in many of these characteristics. In the past, the wood of Northern Catalpa was used to make rail ties and fence posts because its wood is resistant to moisture and decay. Today, it is cultivated as an ornamental landscape tree. The two trees in this genus have a very distinct appearance and can't be confused with anything else.